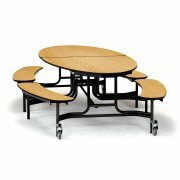 Oval Bench Cafeteria Tables from NPS are designed for safety, convenience and durability. An exclusive curved frame design and generous spacing between benches prevent tripping and enable easy entry. A torsion bar system allows one-person folding and unfolding and an automatic lock keeps the table firmly positioned when fully folded or fully opened. These tables also lock in the partially-folded position for easy floor cleaning. 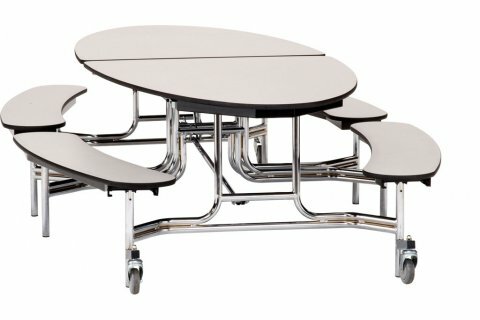 NPS cafeteria tables are built to last. They roll into position on heavy-duty casters which lift off the floor when the table is in the fully-open position. Tough steel frames are connected with tamper-free hardware. The surface and benches are reinforced by steel aprons. 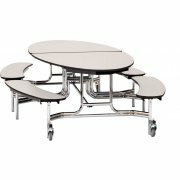 These lunchroom tables have everything you need to accommodate your bustling eating space.